For other uses, see Mission (disambiguation). The earliest Christian mission, then, the Great Commission and Dispersion of the Apostles, was active within Second Temple Judaism. Whether a Jewish proselytism existed or not that would have served as a model for the early Christians is unclear, see Circumcision controversy in early Christianity#Jewish background for details. Soon, the expansion of the Christian mission beyond Judaism to those who were not Jewish became a contested issue, notably at the Council of Jerusalem. The Apostle Paul was an early proponent of this expansion, and contextualized the Christian message for the Greek and Roman cultures, allowing it to reach beyond its Hebrew and Jewish roots. From Late Antiquity onward, much missionary activity was carried out by members of religious orders. Monasteries followed disciplines and supported missions, libraries, and practical research, all of which were perceived as works to reduce human misery and suffering and glorify the Christian God. For example, Nestorian communities evangelized parts of Central Asia, as well as Tibet, China, and India. Cistercians evangelized much of Northern Europe, as well as developing most of European agriculture's classic techniques. St Patrick evangelized many in Ireland. St David was active in Wales. During the Middle Ages, Ramon Llull (c. 1232 – c. 1315) advanced the concept of preaching to Muslims and converting them to Christianity by means of non-violent argument. A vision for large-scale mission to Muslims would die with him, not to be revived until the 19th Century. Additional events can be found at the timeline of Christian missions. During the Middle Ages Christian monasteries and missionaries such as Saint Patrick, and Adalbert of Prague propagated learning and religion beyond the boundaries of the old Roman Empire. In the seventh century Gregory the Great sent missionaries, including Augustine of Canterbury, into England. The Hiberno-Scottish mission began in 563. One of the main goals of the Christopher Columbus expedition financed by Queen Isabella of Spain was to spread Christianity. During the Age of Discovery, Spain and Portugal established many missions in their American and Asian colonies. The most active orders were the Jesuits, Augustinians, Franciscans and Dominicans. The Portuguese sent missions into Africa. These are some of the most well-known missions in history. While some of these missions were associated with imperialism and oppression, others (notably Matteo Ricci's Jesuit mission to China) were relatively peaceful and focused on integration rather than cultural imperialism. In both Portugal and Spain, religion was an integral part of the state and evangelization was seen as having both secular and spiritual benefits. Wherever these powers attempted to expand their territories or influence, missionaries would soon follow. By the Treaty of Tordesillas, the two powers divided the world between them into exclusive spheres of influence, trade and colonization. The proselytization of Asia became linked to Portuguese colonial policy. Portuguese trade with Asia rapidly proved profitable from 1499 onwards, and as Jesuits arrived in India around 1540, the colonial government in Goa supported the mission with incentives for baptized Christians. Later, the Church sent Jesuits to China (1552 onwards) and to other countries in Asia. The Reformation unfolded in Europe in the early 16th century. For over a hundred years, occupied by their struggle with the Catholic Church, the early Protestant churches as a body were not strongly focused on missions to "heathen" lands. Instead, the focus was initially more on Christian lands in the hope to spread the Protestant faith, identifying the papacy with the Antichrist. In the centuries that followed, Protestant churches began sending out missionaries in increasing numbers, spreading the proclamation of the Christian message to previously unreached people. In North America, missionaries to the Native Americans included Jonathan Edwards (1703–1758), the well-known preacher of the Great Awakening (ca 1731–1755), who in his later years retired from the very public life of his early career. He became a missionary to the Housatonic Native Americans (1751) and a staunch advocate for them against cultural imperialism. As European culture has been established in the midst of indigenous peoples, the cultural distance between Christians of differing cultures has been difficult to overcome. [clarification needed] One early solution was the creation of segregated "praying towns" of Christian natives. This pattern of grudging acceptance of converts played out again later in Hawaii when missionaries from that same[which?] New England culture went there. In the course of the Spanish colonization of the Americas, the Catholic missionaries learned the languages of the Amerindians and devised writing systems for them. Then they preached to indigenous people in those languages (Quechua, Guarani, Nahuatl) instead of Spanish, to keep Indians away from "sinful" whites. An extreme case of segregation occurred in the Guarani Reductions, a theocratic semi-independent region established by the Jesuits in the region of the future Paraguay between the early 17th century and 1767. From 1732 onwards the Moravian Church began sending out missionaries. Around 1780, an indigent Baptist cobbler named William Carey began reading about James Cook's travels voyages in Polynesia. His interest grew to a furious sort of "backwards homesickness", inspiring him to obtain Baptist orders, and eventually to write his famous 1792 pamphlet, "An Enquiry into the Obligation of Christians to use Means for the Conversion of Heathen". Far from a dry book of theology, Carey's work used the best available geographic and ethnographic data to map and count the number of people who had never heard the Gospel. It inspired a movement that has grown with increasing speed from his day to the present. In the United States, the American Board of Commissioners for Foreign Missions (ABCFM) was chartered in 1812. Protestant missionaries from the Anglican and Lutheran and Presbyterian traditions starting arriving in what was then the Ottoman Empire in the first half of the 19th Century. This eventually let to the creation of what are today the Evangelical Lutheran Church in Jordan and the Holy Land and the see of the Anglican Bishop in Jerusalem. Furthermore, it was during this time that the Christian and Missionary Alliance started their missionary activity in Jerusalem. American "Hard-shell Baptists", "Anti-Mission Baptists", or "Old School Baptists" adhering to strict Calvinism rejected all mission boards, Bible tract societies, and temperance societies as nonbiblical. The mainstream of the Baptist denomination, however, supported missionary work. Thomas Coke, (1747–1814) the first bishop of the American Methodists, was "the Father of Methodist Missions". After spending time in the newly formed United States of America strengthening the infant Methodist Church alongside Episcopal colleague Francis Asbury, the British-born Coke left for mission work. During his time in America, Coke worked vigorously to increase Methodist support of Christian missions and of raising up mission workers. Coke died while on a mission trip to India, but his legacy among Methodists – his passion for missions – continues. A wave of missions, starting in the early 1850s, targeted inland areas, led by Hudson Taylor (1832–1905) with his China Inland Mission (1865– ). Taylor was later supported by Henry Grattan Guinness (1835–1910) who founded (1883) Cliff College, which continues as of 2014[update] to train and equip for local and global mission. The missions inspired by Taylor and Guinness have collectively been called[by whom?] "faith missions" and owe much to the ideas and example of Anthony Norris Groves (1795–1853). Taylor, a thorough-going nativist, offended the missionaries of his era by wearing Chinese clothing and speaking Chinese at home. His books, speaking, and examples led to the formation of numerous inland missions and of the Student Volunteer Movement (SVM, founded in 1886), which from 1850 to about 1950 sent nearly 10,000 missionaries to inland areas, often at great personal sacrifice. Many early SVM missionaries traveling to areas with endemic tropical diseases left with their belongings packed in a coffin, aware that 80% of them would die within two years. In the 18th century, and even more so in the 19th century, missionaries based in Britain saw the Empire as a fertile field for proselytizing for Christianity. All the main denominations were involved, including the Church of England, the Presbyterians of Scotland, and the Nonconformists. Much of the enthusiasm emerged from the Evangelical revival. Within the Church of England, the Church Mission Society (CMS) originated in 1799 and went on to undertake activity all around the world, including in what became known as "the Middle East". By the 1870s Protestant missions around the world generally acknowledged the long-term material goal was the formation of independent, self-governing, self-supporting, self-propagating churches. The rise of nationalism in the Third World provoked challenges from critics who complained that the missionaries were teaching Western ways, and ignoring the indigenous culture. 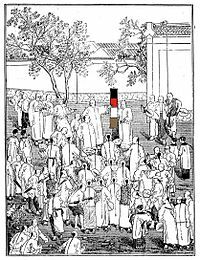 The Boxer Rebellion in China in 1898 involved very large scale attacks on Christian missions and their converts. The First World War diverted resources, and pulled most Germans out of missionary work when that country lost its empire. The worldwide Great Depression of the 1930s was a major blow to funding mission activities. In 1910, the Edinburgh Missionary Conference was presided over by active SVM and YMCA leader (and future Nobel Peace Prize recipient) John R. Mott, an American Methodist layperson, the conference reviewed the state of evangelism, Bible translation, mobilization of church support, and the training of indigenous leadership. Looking to the future, conferees worked on strategies for worldwide evangelism and cooperation. The conference not only established greater ecumenical cooperation in missions, but also essentially launched the modern ecumenical movement. The next wave of missions was started by two missionaries, Cameron Townsend and Donald McGavran, around 1935. These men realized that although earlier missionaries had reached geographic areas, there were numerous ethnographic groups that were isolated by language, or class from the groups that missionaries had reached. Cameron formed Wycliffe Bible Translators to translate the Bible into native languages. McGavran concentrated on finding bridges to cross the class and cultural barriers in places like India, which has upwards of 4,600 peoples, separated by a combination of language, culture, and caste. Despite democratic reforms, caste and class differences are still fundamental in many cultures. An equally important dimension of missions strategy is the indigenous method of nationals reaching their own people. In Asia this wave of missions was pioneered by men like Dr G. D. James of Singapore, Rev Theodore Williams of India and Dr David Cho of Korea. The "two thirds missions movement" as it is referred to, is today a major force in missions. Most modern missionaries and missionary societies have repudiated cultural imperialism, and elected to focus on spreading the gospel and translating the Bible. Sometimes, missionaries have been vital in preserving and documenting the culture of the peoples among whom they live. Often, missionaries provide welfare and health services, as a good deed or to make friends with the locals. Thousands of schools, orphanages, and hospitals have been established by missions. One service provided by missionaries was the Each one, teach one literacy program begun by Dr. Frank Laubach in the Philippines in 1935. The program has since spread around the world and brought literacy to the least enabled members of many societies. During this period missionaries, especially evangelical and Pentecostal missionaries, witnessed a substantial increase in the number of conversions of Muslims to Christianity. In an interview published in 2013 a leader of a key missionary agency focused on Muslims claimed that the world is living in a "day of salvation for Muslims everywhere." The word "mission" was historically often applied to the building, the "mission station" in which the missionary lives or works. In some colonies, these mission stations became a focus of settlement of displaced or formerly nomadic people. Particularly in rural Australia, missions have become localities or ghettoes on the edges of towns which are home to many Indigenous Australians. The word may be seen as derogatory when used in this context. Major nations not only send and fund missionaries abroad, but also receive them from other countries. In 2010, the United States sent out 127,000 missionaries, while 32,400 came to the United States. Brazil was second, sending out 34,000, and receiving 20,000. France sent out 21,000 and received 10,000. Britain sent out 15,000 and received 10,000. India sent out 10,000 and received 8000. Other major exporters included Spain at 21,000 sent out, Italy at 20,000, South Korea at 20,000, Germany at 14,000, and Canada at 8,500. Large recipient nations included Russia, receiving 20,000; Congo receiving 15,000; South Africa, 12,000; Argentina, 10,000; and Chile, 8,500. The largest sending agency in the United States was the Southern Baptist Convention, with 4,800 missionaries, plus 450 support staff working inside the United States. The annual budget is about $50,000 per year per missionary. In recent years, however, the Southern Baptist foreign missionary operation (the International Mission Board) has operated at a deficit, and it is cutting operations by 15 percent. It is encouraging older missionaries to retire and return to the United States. The Lausanne Congress of 1974, birthed a movement that supports evangelical mission among non-Christians and nominal Christians. It regards "mission" as that which is designed "to form a viable indigenous church-planting and world changing movement." This definition is motivated by a theologically imperative theme of the Bible to make God known, as outlined in the Great Commission. The definition is claimed to summarize the acts of Jesus' ministry, which is taken as a model motivation for all ministries. This Christian missionary movement seeks to implement churches after the pattern of the first century Apostles. The process of forming disciples is necessarily social. "Church" should be understood in the widest sense, as a body of believers of Christ rather than simply a building. In this view, even those who are already culturally Christian must be "evangelized". Church planting by cross-cultural missionaries leads to the establishment of self-governing, self-supporting and self-propagating communities of believers. This is the famous "three-self" formula formulated by Henry Venn of the London Church Missionary Society in the 19th century. Cross-cultural missionaries are persons who accept church-planting duties to evangelize people outside their culture, as Christ commanded in the Great Commission (Matthew 28:18–20, Mark 16:15–18). The objective of these missionaries is to give an understandable presentation of their beliefs with the hope that people will choose to following the teaching of Jesus Christ and live their lives as His disciples. As a matter of strategy, many evangelical Christians around the world now focus on what they call the "10/40 window", a band of countries between 10 and 40 degrees north latitude and reaching from western Africa through Asia. Christian missions strategist Luis Bush pinpointed the need for a major focus of evangelism in the "10/40 Window", a phrase he coined in his presentation at the missionary conference Lausanne 1989 in Manila. Sometimes referred to as the "Resistant Belt", it is an area that includes 35% of the world's land mass, 90% of the world's poorest peoples and 95% of those who have yet to hear anything about Christianity. Modern mission techniques are sufficiently refined that within ten to fifteen years, most indigenous churches are locally pastored, managed, taught, self-supporting and evangelizing. The process can be substantially faster if a preexisting translation of the Bible and higher pastoral education are already available, perhaps left over from earlier, less effective missions. One strategy is to let indigenous cultural groups decide to adopt Christian doctrines and benefits, when (as in most cultures) such major decisions are normally made by groups. In this way, opinion leaders in the groups can persuade much or most of the groups to convert. When combined with training in discipleship, church planting and other modern missionary doctrine, the result is an accelerating, self-propelled conversion of large portions of the culture. A missionary radio group recruits, trains and broadcasts in the main dialect of the target culture's language. Broadcast content is carefully adapted to avoid syncretism yet help the Christian Gospel seem like a native, normal part of the target culture. Broadcast content often includes news, music, entertainment and education in the language, as well as purely Christian items. Broadcasts might advertise programs, inexpensive radios (possibly spring-wound), and a literature ministry that sells a Christian mail-order correspondence course at nominal costs. The literature ministry is key, and is normally a separate organization from the radio ministry. Modern literature missions are shifting to web-based content where it makes sense (as in Western Europe and Japan). When a person or group completes a correspondence course, they are invited to contact a church-planting missionary group from (if possible) a related cultural group. The church-planting ministry is usually a different ministry from either the literature or radio ministries. The church-planting ministry usually requires its missionaries to be fluent in the target language, and trained in modern church-planting techniques. The missionary then leads the group to start a church. Churches planted by these groups are usually a group that meets in a house. The object is the minimum organization that can perform the required character development and spiritual growth. Buildings, complex ministries and other expensive items are mentioned, but deprecated until the group naturally achieves the size and budget to afford them. The crucial training is how to become a Christian (by faith in Jesus Christ) and then how to set up a church (meet to study the Bible, and perform communion and worship), usually in that order. A new generation of churches is created, and the growth begins to accelerate geometrically. Frequently, daughter churches are created only a few months after a church's creation. In the fastest-growing Christian movements, the pastoral education is "pipelined", flowing in a just-in-time fashion from the central churches to daughter churches. That is, planting of churches does not wait for the complete training of pastors. The most crucial part of church planting is selection and training of leadership. Classically, leadership training required an expensive stay at a seminary, a Bible college. Modern church planters deprecate this because it substantially slows the growth of the church without much immediate benefit. Modern mission doctrines replace the seminary with programmed curricula or (even less expensive) books of discussion questions, and access to real theological books. The materials are usually made available in a major trading language in which most native leaders are likely to be fluent. In some cases, the materials can be adapted for oral use. It turns out that new pastors' practical needs for theology are well addressed by a combination of practical procedures for church planting, discussion in small groups, and motivated Bible-based study from diverse theological texts. As a culture's church's wealth increases, it will naturally form classic seminaries on its own. Another related mission is Bible translation. The above-mentioned literature has to be translated. Missionaries actively experiment with advanced linguistic techniques to speed translation and literacy. Bible translation not only speeds a church's growth by aiding self-training, but it also assures that Christian information becomes a permanent part of the native culture and literature. Some ministries also use modern recording techniques to reach groups with audio that could not be soon reached with literature. For Catholics, “Missions” is the term given to those particular undertakings by which the heralds of the Gospel, sent out by the Church and going forth into the whole world, carry out the task of preaching the Gospel and planting the Church among peoples or groups who do not yet believe in Christ. Vatican II made a deep impact on Catholic missions around the world. The Church's relations to non-Christian religions like Judaism and Islam were revisited. A steep decline in the number of people entering the priesthood and religious life in the West has made the Church look towards laity more and more. Communities like Opus Dei arose to meet this need. Inculturation increasingly became a key topic of missiological reflection for Catholics. Inculturation is understood as the meeting of the Christian message with a community in their cultural context. Liberation Theology and liturgical reform have also been important in forming and influencing the mission of the Catholic Church in the 20th and 21st Centuries. In relation to mission, Pope Benedict XVI made the re-evangelization of Europe and North America a priority in his own ministry, even while the upper leadership of the Roman Catholic hierarchy and the college of cardinals has more members from Latin America, Africa, and Asia than ever before. Key documents on mission for Catholics during this period are Evangelii nuntiandi by Pope Paul VI and Redemptoris missio by Pope John Paul II. Christian mission organisations have long depended on the printed word as a channel through which to do mission. At times when countries have been "closed" to Christians, great efforts have been made to smuggle Bibles and other literature into those countries. Brother Andrew, the founder of Open Doors, started smuggling Bibles into communist countries in the 1950s. Operation Mobilisation was established in 1957 by George Verwer. Other Christian publishers, such as Plough Publishing, provide free books to people in the UK and US as a form of mission. The Bible Society translates and prints Bibles, in an attempt to reach every country in the world. The internet now provides Christian mission organisations a convent way of reaching people in the form of podcasts. Podcasts provide a way of dissemination for a message that has potential to endanger the recipient, since it is very hard to track who has downloaded a specific podcast. An example of this is the Crescent Project. Other podcasts, such as the Life Together podcast, The Sacred, and Harvest are aimed at both non-Christians and Christians in the home country. Objections to missionary work among isolated, indigenous populations involve the claim that the goal of mission is to Westernize them. Such claims have been raised by indigenous rights groups organizations, such as Friends of Peoples Close to Nature and Survival International. The Europeans contact with indigenous since 1492 has killed 100 million from the imported diseases to which tribes had no immunity. Missionaries, along with other travelers, brought diseases into local populations. Smallpox, measles, even the common cold, have been blamed on their arrivals. David Igler of the University of California, Irvine, includes missionary activity as a cause of spreading germs. However, he says that commercial traders were the main agents of disease. ... other diseases arrived on non-commercial voyages; missionary activities certainly spread germs, and Spanish conquests had dispersed deadly germs in parts of the Americas and Pacific prior to the late eighteenth century. Yet, for the period between the 1770s and the 1840s, trading vessels were the main agents of disease, creating in the Pacific what Emmanuel Le Roy Ladurie has called a "paroxysm" of the "microbian unification of the world." By 1850, the microbes of Europe, Asia, and Africa circulated in almost every Pacific population. Political scientist Robert Woodberry uses statistics to argue that conversionary Protestants were a crucial catalyst in spreading religious liberty, education, and democracy. He shows that statistically the prevalence of such missionaries account for half of the variance in democracy in Africa, Asia, Latin America and Oceania. In a 2014 Christianity Today article, he remarks, "Areas where Protestant missionaries had a significant presence in the past are on average more economically developed today, with comparatively better health, lower infant mortality, lower corruption, greater literacy, higher educational attainment (especially for women), and more robust membership in nongovernmental associations." In India, Hindu organisations such as the Rashtriya Swayamsevak Sangh assert that most conversions undertaken by zealous evangelicals occur due to compulsion, inducement or fraud. In the Indian state of Tripura, the government has alleged financial and weapons-smuggling connections between Baptist missionaries and rebel groups such as the National Liberation Front of Tripura. The accused Tripura Baptist Christian Union is a member body of the Baptist World Alliance. "In mid-May, the Vatican was also co-sponsoring a meeting about how some religious groups abuse liberties by proselytizing, or by evangelizing in aggressive or deceptive ways. Iraq ... has become an open field for foreigners looking for fresh converts. Some Catholic Church leaders and aid organizations have expressed concern about new Christian groups coming in and luring Iraqis to their churches with offers of cash, clothing, food or jobs.... Reports of aggressive proselytism and reportedly forced conversions in mostly Hindu India have fueled religious tensions and violence there and have prompted some regional governments to pass laws banning proselytism or religious conversion.... Sadhvi Vrnda Chaitanya, a Hindu monk from southern India, told CNS that India's poor and uneducated are especially vulnerable to coercive or deceptive methods of evangelization.... Aid work must not hide any ulterior motives and avoid exploiting vulnerable people like children and the disabled, she said." In an interview with Outlook Magazine, Sadhvi Vrnda Chaitanya said "If the Vatican could understand that every religious and spiritual tradition is as sacred as Christianity, and that they have a right to exist without being denigrated or extinguished, it will greatly serve the interests of dialogue, mutual respect, and peaceful coexistence." While there is a general agreement among most major aid organizations not to mix aid with proselyting, others see disasters as a useful opportunity to spread the word. One such an occurrence was the tsunami that devastated parts of Asia on December 26, 2004. "This (disaster) is one of the greatest opportunities God has given us to share his love with people," said K.P. Yohannan, president of the Texas-based Gospel for Asia. In an interview, Yohannan said his 14,500 "native missionaries" in India, Sri Lanka and the Andaman Islands are giving survivors Bibles and booklets about "how to find hope in this time through the word of God." In Krabi, Thailand, a Southern Baptist church had been "praying for a way to make inroads" with a particular ethnic group of fishermen, according to Southern Baptist relief coordinator Pat Julian. Then came the tsunami, "a phenomenal opportunity" to provide ministry and care, Julian told the Baptist Press news service.... Not all evangelicals agree with these tactics. "It's not appropriate in a crisis like this to take advantage of people who are hurting and suffering", said the Rev. Franklin Graham, head of Samaritan's Purse and son of evangelist Billy Graham." The Christian Science Monitor echoes these concerns... "'I think evangelists do this out of the best intentions, but there is a responsibility to try to understand other faith groups and their culture,' says Vince Isner, director of FaithfulAmerica.org, a program of the National Council of Churches USA." The Bush administration has made it easier for U.S. faith-based groups and missionary societies to tie aid and church together. For decades, US policy has sought to avoid intermingling government programs and religious proselytizing. The aim is both to abide by the Constitution's prohibition against a state religion and to ensure that aid recipients don't forgo assistance because they don't share the religion of the provider.... But many of those restrictions were removed by Bush in a little-noticed series of executive orders – a policy change that cleared the way for religious groups to obtain hundreds of millions of dollars in additional government funding. It also helped change the message American aid workers bring to many corners of the world, from emphasizing religious neutrality to touting the healing powers of the Christian God. Missionaries say that the government in India has passed anti-conversion laws in several states that are supposedly meant to prevent conversions from "force or allurement," but are primarily used, they say, to persecute and criminalize voluntary conversion due to the government's broad definition of "force and allurement." Any gift received from a Christian in exchange for, or with the intention of, conversion is considered allurement. Voice of the Martyrs reports that aid-workers claim that they are being hindered from reaching people with much needed services as a result of this persecution. Alan de Lastic, Roman Catholic archbishop of New Delhi states that claims of forced conversion are false. "'There are attacks practically every week, maybe not resulting in death, but still, violent attacks,' Richard Howell, general secretary of the Evangelical Fellowship of India tells The Christian Science Monitor today. 'They [India's controlling BJP party] have created an atmosphere where minorities do feel insecure.'" According to Prakash Louis, director of the secular Indian Social Institute in New Delhi, "We are seeing a broad attempt to stifle religious minorities and their constitutional rights...Today, they say you have no right to convert, Tomorrow you have no right to worship in certain places." Existing congregations, often during times of worship, are being persecuted. Properties are sometimes destroyed and burnt to the ground, while native pastors are sometimes beaten and left for dead. ^ "Mission". Encyclopædia Britannica. Retrieved 8 January 2013. ^ Jenkins, Philip (2008). The Lost History of Christianity: The Thousand Year Golden Age of the Church in the Middle East, Africa, and Asia —and How It Died. ^ Bridger, J. Scott (February 2009). "Raymond Lull: Medieval Theologian, Philosopher, and Missionary to Muslims" (PDF). St Francis Magazine. 5 (1): 1–25. Retrieved 7 January 2013. ^ Županov, Ines G. (2005). Missionary Tropics: The Catholic Frontier in India (16th–17th centuries). University of Michigan. ISBN 978-0-472-11490-0. ^ Roy, Olivier (2010). Holy Ignorance. New York: Columbia University Press. pp. 48–56. ISBN 978-0-231-70126-6. ^ a b Walls, Andrew F. (November 2016). "Eschatology and the Western Missionary Movement". Studies in World Christianity. 22 (3): 182–200. doi:10.3366/swc.2016.0155. ^ Miller, Duane Alexander (December 2007). "The Installation of a Bishop in Jerusalem". Anglican and Episcopal History. 76 (4): 549–554. Retrieved 11 January 2015. ^ Miller, Duane Alexander (June 2010). "Renegotiating the Boundaries of Evangelicalism in Jerusalem's Christian Quarter". Anglican and Episcopal History. 79 (2): 185–188. Retrieved 11 January 2015. ^ Ward, Kevin (2006). A History of Global Anglicanism. New York: Cambridge U Press. p. 34. ^ Susan Thorne (1999). Congregational Missions and the Making of an Imperial Culture in Nineteenth-Century England. Stanford University Press, ch 1. ISBN 9780804765442. ^ Andrew Porter, "Religion, Missionary Enthusiasm, and Empire," in Porter, ed., Oxford History of the British Empire (1999) vol 3 pp 223–24. ^ Ryan Johnson, "Colonial Mission and Imperial Tropical Medicine: Livingstone College, London, 1893–1914," Social History of Medicine (2010) 23#3 pp 549–566. ^ Gairdner, Temple (1910). Echoes from Edinburgh 1910. London: Anderson & Ferrier. ^ James-Nathan, Violet (2000). "One". In Jonathan James and Malcolm Tan. That Asia May Know: Perspectives on Missions in Asia (40th Anniversary Commemorative ed.). Asia Evangelistic Fellowship International. pp. 8–43. ISBN 978-0-646-39763-4. ^ "Indian Evangelical Mission". Retrieved 1 February 2014. ^ Miller, Duane Alexander (February 2010). "Woven in the Weakness of the Changing Body: the Genesis of World Islamic Christianity" (PDF). CTFC. 2. Retrieved 7 January 2013. ^ Blincoe, Bob; Duane Alexander Miller (January 2013). "The Day of Salvation for Muslims Everywhere: an interview with Bob Blincoe". Global Missiology. 10 (2). Retrieved 7 January 2013. ^ Tamara Audi, "Cash-Strapped Missionaries Get a New Calling: Home—Years of overspending to support Southern Baptist missionary work has led to budget crunch," Wall Street Journal 25 October, 2015. ^ Decree on the Mission Activity of the Church: Ad Gentes. (Para. 6) In Vatican II Documents, (1965), Vatican City: Libreria Editrice Vaticana. ^ Edwards, Tito (June 2010). "Benedict Opens New Evangelization of Europe and America Office". The American Catholic. Retrieved 18 January 2013. ^ Palmo, Rocco. "B16's October Surprise". Retrieved 18 January 2013. ^ Ireland, Open Doors UK &. "Open Doors history". www.opendoorsuk.org. Retrieved 2017-06-15. ^ Mobilisation, Operation. "About Operation Mobilisation". Operation Mobilisation. Retrieved 2017-06-15. ^ "About Us". Plough. Retrieved 2017-06-15. ^ "Home". www.biblesociety.org.uk. Retrieved 2017-06-15. ^ "Podcast — Crescent Project". Crescent Project. Retrieved 2018-11-22. ^ "Bruderhof Communities". SoundCloud. Retrieved 2018-11-22. ^ "Podcasts - Harvest: Greg Laurie". Harvest: Greg Laurie. Retrieved 2018-11-22. ^ Witmer, A. C. (September 1885). "The Islands of the Sea". The Gospel in All Lands. New York, NY: Methodist Episcopal Church Mission Society: 437. Retrieved 2011-11-20. ^ Igler, David (June 2004). "Diseased Goods: Global Exchanges in the Eastern Pacific Basin, 1770–1850". The American Historical Review. Chicago, Illinois: American Historical Association. 109 (3): 693–719. doi:10.1086/530552. Retrieved 2011-11-20. ^ "Missions: Rescuing from Hell and Renewing the World". 2014-01-13. ^ Subir Bhaumik (18 April 2000). "Church backing Tripura rebels". BBC News. Retrieved August 9, 2007. ^ Carol Glatz (May 19, 2006). "Legislating conversions: Weighing the message vs. the person". Catholic Online. Retrieved August 7, 2007. ^ Seema Sirohi (October 2, 2006). "Father Complex". OutlookIndia.com. Retrieved August 7, 2007. ^ Burke, Jason (January 16, 2005). "Religious aid groups try to convert victims". The Guardian. Retrieved June 19, 2013. ^ "In Asia, some Christian groups spread supplies – and the word". Knight-Ridder Newspapers. January 12, 2005. Retrieved June 19, 2013. ^ Jane Lampman (January 31, 2005). "Disaster Aid Furthers Fears of Proselytizing". Christian Science Monitor. Retrieved August 7, 2007. ^ "Bush brings faith to foreign aid". Boston.com. The Boston Globe. October 8, 2006. Retrieved August 7, 2007. ^ "Indian Express". Archived from the original on 2009-04-12. Retrieved 2013-04-15. ^ Ted Olsen (September 1, 2003). "Weblog: Missionaries in India Concerned as Hindu Activists Break Up Prayer Meeting". Christianity Today. Retrieved August 7, 2007. ^ "Christian murdered in Kerala". Christian Today – India Edition. February 14, 2007. Retrieved August 7, 2007. ^ "Two Nuns accused and held for trying to "convert" students". Evangelical Fellowship of India. Retrieved August 7, 2007. ^ "Five arrested for assaulting trainee priests in Panvel". Evangelical Fellowship of India. March 7, 2007. Retrieved August 7, 2007. ^ "Christians attacked in Jalampur, Dhamtari in Chhattisgarh". Evangelical Fellowship of India. January 10, 2006. Retrieved August 7, 2007. ^ Jacob Chaterjee (February 12, 2007). "Hindu radicals attack believers in Karnataka". Christian Today – India Edition. Retrieved August 7, 2007. ^ Jacob Chaterjee (February 20, 2007). "Hindu radicals attack Bible college students during outreach; two in critical condition". Christian Today – India Edition. Retrieved August 7, 2007. ^ Jacob Chaterjee (February 6, 2007). "Hindu radicals attack Christian prayer meeting in Bihar". Retrieved August 7, 2007. ^ Jacob Chaterjee (February 18, 2007). "Hindu fanatics oppose Christian-run orphanage and Bible center in Himachal Pradesh". Christian Today – India Edition. Retrieved August 7, 2007. Barrett, David, ed. World Christian Encyclopedia, Oxford University Press, 1982. Beaver, R. Pierce. "North American Thought on the Fundamental Principles of Missions During the Twentieth Century." Church History 21.4 (1952): 345-364. Beaver, R. Pierce. ed American Missions in Bicentennial Perspective(1977). Beaver, Robert Pierce. American Protestant Women in World Mission: History of the First Feminist Movement in North America. (WB Eerdmans Publishing Company, 1980). Beaver, Robert Pierce. Church, state, and the American Indians: two and a half centuries of partnership in missions between Protestant churches and government (Concordia Pub. House, 1966). Beaver, Robert Pierce. Missionary Motivation through Three Centuries (1968). Hutchison, William R. (1993). Errand to the World: American Protestant Thought and Foreign Missions. University of Chicago Press. ISBN 9780226363103. Županov, Ines G. (2005). Missionary Tropics: The Catholic Frontier in India (16th–17th centuries). University of Michigan. ISBN 978-0-472-11490-0.